By the third day people were returning to work and a fierce anti-union backlash, fueled by fears of a Bolshevik-style revolution, ensured the strike’s early end. But it put Seattle on the international map and is still remembered as a touchstone for the city’s progressive politics. To mark the occasion, the University of Washington Press has reissued a book about the strike: “The Seattle General Strike, Centennial Edition” by Robert L. Friedheim. First published in 1964, the new edition features a new introduction, foreword and afterward by University of Washington Labor Studies professor James N. Gregory which brings the story into the 21st century. Q: Describe the mood of the city on the eve of the strike. A: It was a time of exuberance and excitement, but also confusion. The war had ended with a great victory for the Allies, but the city had recently been devastated by the Spanish flu epidemic. Workers thought they were ready for pay raises that had been denied in the shipyards and elsewhere. There was a mood of militancy on the part of labor, and on the part of people not in the labor movement, there was fear … many people on the conservative side were very alarmed at the potential for revolutionary uprising. Q: Why was Seattle such a strong union town? A: Seattle was one of a handful of cities where organized labor was very strong — New York, Chicago, San Francisco and Seattle. The unions had been successful at organizing thanks to the need for labor, the expansion in the shipyards and the need for peaceable relations between employers and employees. 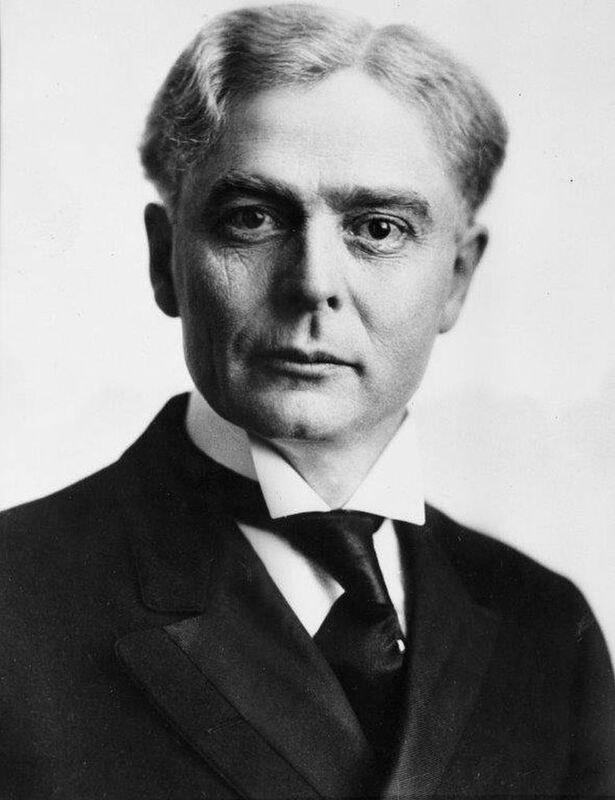 The government had encouraged owners to recognize unions. The defense industry said deal with unions, we don’t want labor unrest. By war’s end there were about 60,000 union members in Seattle. Virtually everyone in the blue-collar sector belonged to a union, and many in the service sector, particularly women. 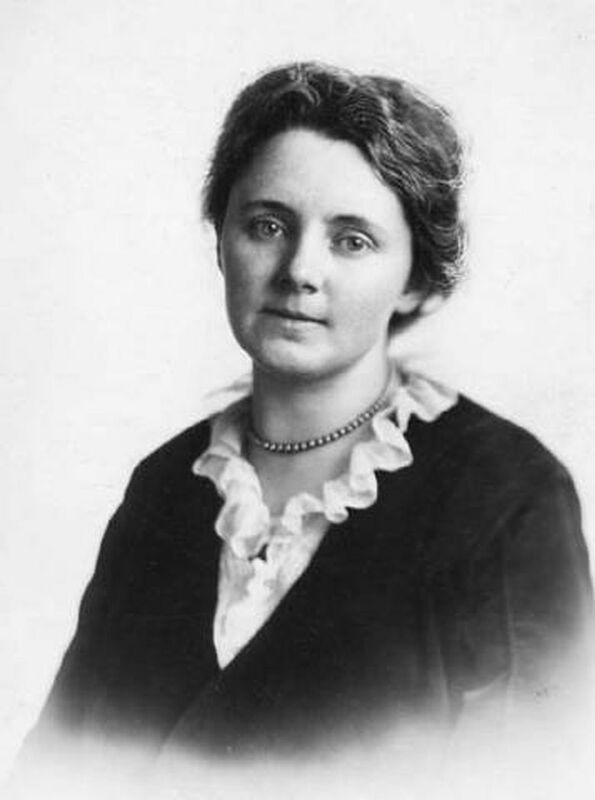 One of the most successful was the waitress union — by 1919 it had almost 500 members. One of labor’s tools was to boycott nonunion places, so employers just went with the program. Altogether, the Seattle central labor council represented 110 unions, and virtually all of them agreed to the sympathy strike. Q: How did the federal government help precipitate the strike? Is it accurate to say the government refused to let the shipyard owners negotiate with the union for higher wages? A: That’s a simple way to say it, though I think the shipyard owners were for the most part happy to be backed up by Piez (Charles Piez, who helped oversee the government’s shipbuilding program). The bottom line was the federal government was managing the shipyards from 1917 to the end of the war, and it had implied a promise to negotiate wages after the end of the war. Piez broke that promise. He said you cannot raise wages. Q: Union after union voted to go out on strike, to the surprise of many labor leaders — 110 unions, 60,000 members. Why? A: In contemporary terms it was a remarkable set of decisions. All these unions went out on strike, not for their own benefit, but to support shipyard workers. It was a sympathy strike, a selfless act of solidarity. It reflected a sense of community among the working class of Seattle — the waitresses and the electricians and the laundry workers agreed that it was important to help the shipyard workers. You can see behind it a very different feeling about what unions represent than what people understand today. It was a visionary movement — the idea that by all of us working together and developing union power, we will not only help ourselves but the whole society. Q: The Seattle General Strike was completely peaceful; not a shot was fired on either side, and not a single striker was arrested for breach of the peace. How did the strikers pull that off? A: I think that was the truly remarkable accomplishment and legacy of the general strike. While there had been general strikes before, they almost always turned into very violent affairs. This was the first declared general strike in the 20th century in the U.S. and it should have been pretty scary — the anarchists and the syndicalists had come up with the idea of a general strike as the opening salvo of a revolutionary movement. But when the Seattle Central Labor Council decided to embark on one, they took steps to ensure it would remain peaceful. The main step was to encourage union members to stay off the streets. The union recruited 300 veterans, who all wore white armbands and walked around the streets, discouraging anything that might invite street action. The strike was publicized four days before it actually began. The strike committee met with city officials to work out what would stay open and what would close. Employers who ran union establishments told their workers to stay home. Others wanted to avoid trouble, so they told their workers to stay home. The big payoff was that something like this was carried out without any violence at all. Q: Why did it end? A: The central labor council and the leaders didn’t anticipate the hostile and fearful reactions on the part of the community. 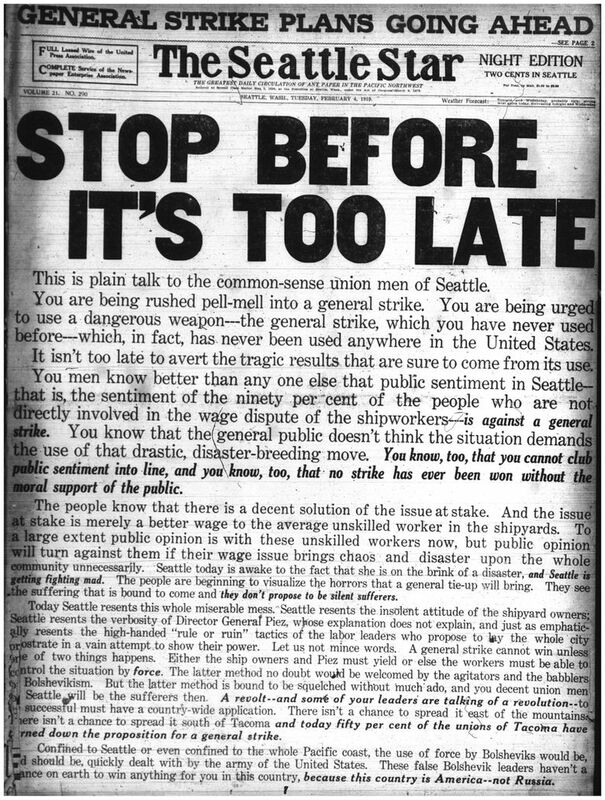 The Seattle Star was a labor-friendly newspaper, but its editorial board came out right away with fearful editorials demanding that the strike end, that this was a pathway to revolution. It was thought that the city council and the mayor’s office would remain neutral, but that didn’t come to pass at all. The labor movement realized that the cards were stacked in a way that they had not anticipated. The press was hostile, the city apparatus was opposed. The mayor threatened martial law on the second day and the federal troops entered the city. In the first two days the strike committee was thrilled with the participation rate, but then some unions said they would go back over the weekend. The biggest error was not articulating a strategy for ending the strike, not creating mileposts for ending it. It did seem like a retreat to have to call it off. It was going nowhere, people were getting antsy and started going back to work. On Monday the strike committee met and said this is over, we need to make it official. It ended on Tuesday. Q: What was its legacy? A: Robert Friedheim (the book’s original author, now deceased) called the strike a disaster, but none of the union members involved in it seemed to think it was a failure. 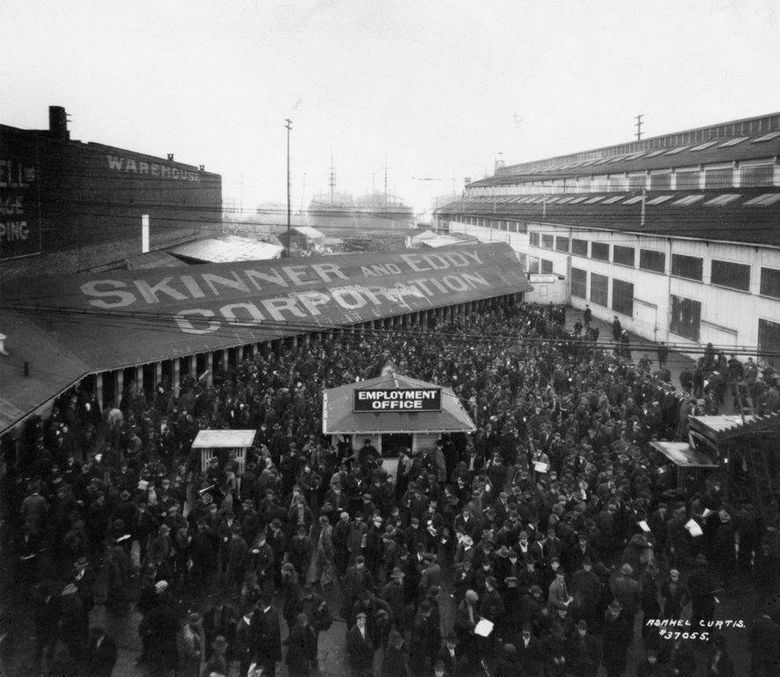 It’s true that the shipyard workers never won their case, but the cancellation of shipyard contracts would have happened anyway, which helped start an economic depression in 1920. The contracts ended, people lost their jobs and left town. But the general strike itself wasn’t thought of as a failure. The unions were mostly thrilled by the solidarity and the peacefulness, the sense that the strike committee had managed to run critical services for the city. They thought, Gee, this is wonderful, we don’t even need capitalism. We had fulfilled the vision of workers being able to manage things. James Gregory will discuss the Seattle General Strike at 6 p.m. Monday, Feb. 4, at Seattle’s University Book Store. He will appear at several other events in February commemorating the strike. For more information, visit solidaritycentennial.com/events/.